Holiday Celebrations of Golden Oak Club Filled with Fun and a Dash of Magic! Even though winter is now fading into spring, memories of the Golden Oak Club's 2015 holiday celebrations still shine bright. 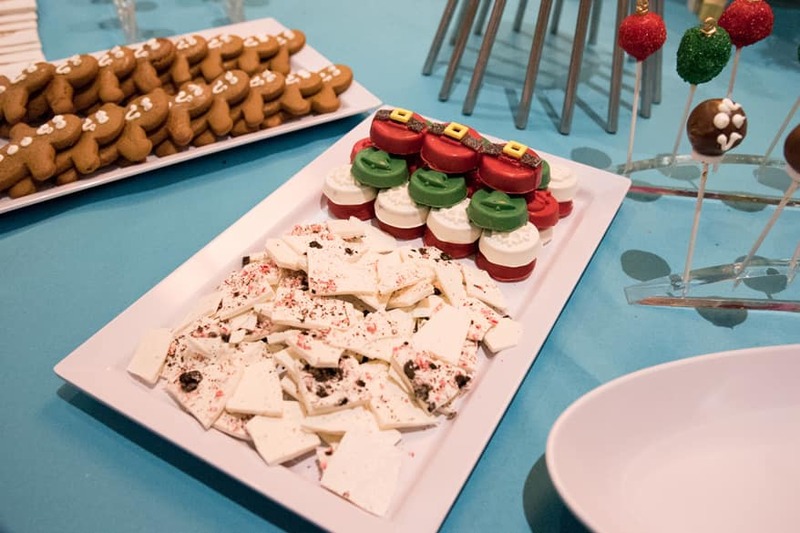 The season's well-rounded roster of themed parties, tasty dinners and festive events offered something for everyone. Residents are big fans of the Club's annual merry-making and memory-making. "We look forward to the holiday events at Golden Oak every year," summed up one resident. And another: "It has become a part of our family tradition, particularly the annual holiday party for Club members. Each year is better and better." Launching this season's revelry on December 10 was a trip to Disney's Hollywood Studios® for The Osborne Family Spectacle of Dancing Lights and a visit with Santa Goofy. Residents enjoyed private seating and the children got to join Santa Goofy when he flipped the switch to illuminate the pageant of lights at the show, which would be closing at year's end. The effect "was stunning", said one resident, and another commented, "I was crying, it was so sweet—and they weren't even my kids!" Music filled the air and spirits soared at a lively performance on December 12 by the Trans-Siberian Orchestra, serenading residents in a private suite at the Amway Center. Residents gathered on December 21 in the Summerhouse Family Room for the Ornament Decorating Event, which has fast become a fun holiday celebration. Craft supplies were provided and residents showed quite the creative flair in decorating their ornaments. With its Toy Story theme, the Golden Oak Club Member Holiday Party on December 18 sent the holiday cheer to infinity and beyond for residents and their guests. Sarge and his Green Army Men greeted arrivals at the Summerhouse courtyard, while elsewhere endearing Toy Story scenes ranged from the Space Cadet Lounge and Bucket O' Soldiers to Pizza Planet and Sunnyside Daycare. Food in the rooms complemented each theme, such as the BBQ Pork Rib Tips in Woody's Round-Up (Markham's Restaurant) and pizza and chicken wings in Pizza Planet. Later in the evening, Buzz, Woody, Jessie and Bullseye arrived for photo opportunities in Andy's Room (the Summerhouse Family Room). At the Ugly Holiday Sweater Sunday Supper on December 20, residents came dressed to win… a race to the bottom! The evening was mirthful as contestants vied for the annual title of Ugliest Sweater and the award of a suitably tacky first-place button. As for the supper menu, it was as ever the height of good taste, led by artfully prepared entrées of Chicken Savoy and Hand-Braised Cavatelli. On the eve of his biggest night of the year, December 23, jolly old Saint Nick stopped by Markham's for a delicious Dinner with Santa event. Children received boxes of cookies from Mrs. Claus and discussed with Santa their holiday wish-lists. As the lists had been sent to him in a special mailbox at Resident Services earlier in the week, Santa knew exactly what was on each child's list and enchanted them with his special knowledge. Even 2 little girls who had been hesitant to meet Santa believed in the magic by the end of the night. There were smiles all around! The Christmas Eve Dinner at Markham's wowed residents with a parade of special-occasion selections, including house-made fettuccini Alfredo, house-made baked manicotti, chicken savoy, carved prime rib, carved garlic-crusted stuffed pork tenderloin and braised monkfish. And the 7-item dessert menu set many faces aglow! The flurry of holiday offerings resumed a week later at a private New Year's Eve Reception with Fireworks, where residents and guests rang in 2016 at the France Pavilion in Epcot®. The fantastical celebration featured the New Year's Eve version of Illuminations: Reflections of Earth and was accompanied by a custom menu of cocktails, hors d'oeuvres and decadent desserts. The next day, residents gathered at Markham's for a New Year's Day Brunch. Chef de Cuisine Phillip and team served up the perfect combination of traditional holiday dishes and favorite lunch-and-brunch fare with such selections as black-eyed peas with collard greens and Andouille sausage, chicken and grits with Tabasco-maple syrup, eggs benedict, the ever-popular Golden Oak Burger with Cotswold cheese and bacon. The finale? Actually, there were 4, each a sweet send-off into the New Year: crème brûlée,7-layer chocolate cake, house-made cream puffs and donuts. Cast Members and residents alike agree that the holiday celebrations at Golden Oak have become some of their favorite memories and traditions. Said a Cast Member, "It's a time of the year here that people don't want to miss!" Some resident events are included in membership in the Golden Oak Club, while others are available for an additional fee.